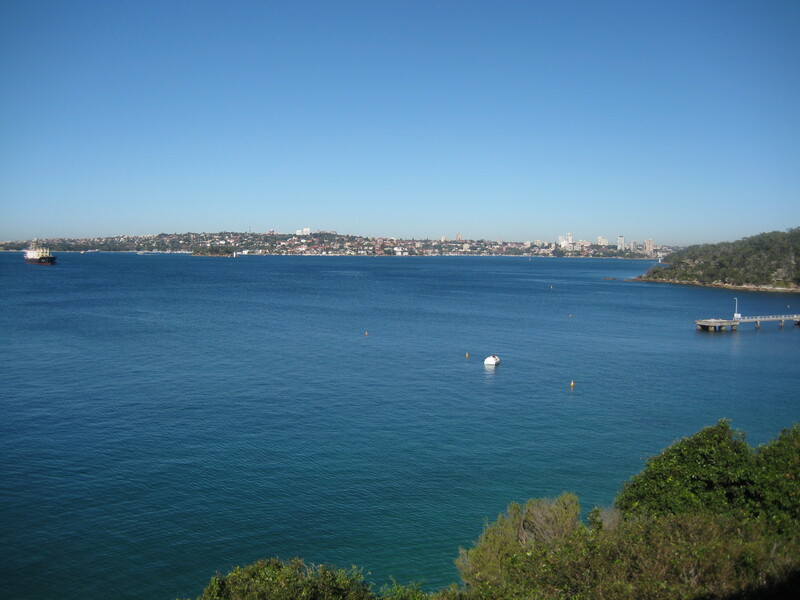 Home > Chinese, Sydney, Thoughts	> 2 weeks in Sydney came and gone! 2 weeks in Sydney came and gone! Two weeks in Sydney seemed so short, but at the same time seemed so long! I was away from Hubby for 17 days, and although it’s not the longest we have been apart, I sure did miss him! However, it was good to see my parents and catch up with friends. I was in Sydney for work and not only was it weird to be back, it was weird to be staying with my parents again! Not only that, I no longer had my own room. It was taken over by my brother, and I now sleep in his room! Thankfully, my dad was kind enough to open the windows, to air it, so it didn’t have that ‘boy’ smell! Thanks dad! The best thing about living with my mum (besides the obvious company) is the food! 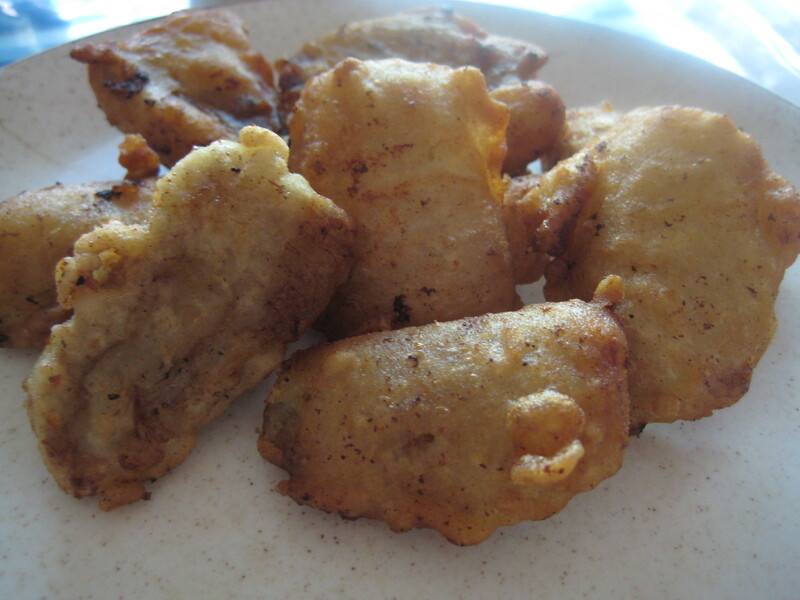 I woke up one weekend to the aroma of her pisang goreng (banana fritters). Mum knew how much I loved pisang goreng, hers especially, so she got up early to make some. The pisang goreng were deliciously sweet, from the banana, and the batter was thin. It was absolutely fantastic. She has taught me many times, and I have written the recipe, but without a deep fryer, it’s just simply too hard to make. Besides, I can always come to visit to eat these, so no need to make them myself.. well not yet anyway! So what did I do for two weeks beside eating and catching up with friends? We (being work) had our investor conference, and we had it at Sergeant Mess and it is one of the best venues I have ever been and seen! We took a ferry to Chowder Bay the morning of the event from Circular Quay, and I made sure I stood outside as I get serious motion sickness! Thankfully, it wasn’t too choppy and the fresh air did me good. Now, the venue, I simply can’t say how fantastic the service and the food were! The staffs were great and helpful and they seriously made the day run smoothly! Here is a view from the deck – unfortunately I didn’t get to enjoy it as much as I wanted but I did manage to sit on the deck with a cup of coffee relaxing. It was too early for beer, otherwise that would have gone down well too! I am proud to say that the day went magnificently. The days leading up to it was a complete nightmare! The night before, when we were testing the presentations at the venue, I (yes I am going to admit this), accidentally deleted a presentation and the animation that went with it! Not sure how, but it’s definitely one feeling I don’t ever want to experience! Now, the meal…. The meal at Sergeant Mess were amazing – unfortunately I didn’t get to take any of the photos! Just didn’t think it was ‘appropriate’! We were definitely well fed! We had breakfast, morning tea, lunch, afternoon tea, canapes AND dinner! I was STUFFED! 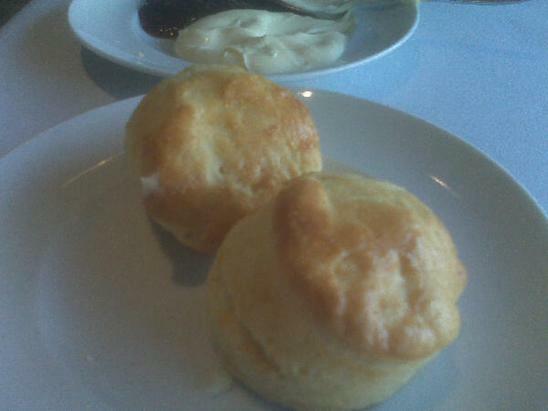 I only managed to take a photo of the scones! These were to die for! Warm scones with cream and jam… OMG… I think A and I ate about 4 each. We even asked the staff to bring some to us at the deck as they were packing them away! I should definitely have brought them home! 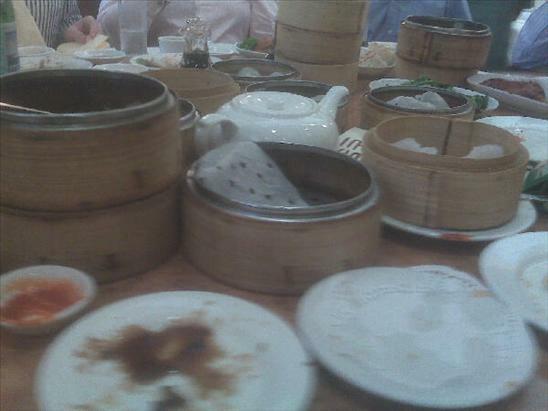 I even managed to squeeze in dim sum at Marigold and even though I didn’t take any photos during – this was the after math! Yes.. we can eat! It was for a farewell… 15 of us, so you can imagine how many dumplings we all ate! Prior to coming to Sydney I made a list of restaurants I wanted to go too (as you do when you travel). Did I go to all of it? Of course not! I would come back looking like a hippo if I did! Lists are below, and I have crossed out the ones I did manage to get too. So 11 / 20 ain’t bad and I did go to some restaurants that were not on the list, like din tai fung, the riverview hotel, and gourmet noodle house to name a few. I didn’t get to catch up with all my friends, and I apologise for that! I ‘should’ be back again in September, so hopefully will catch up with the rest of you then! 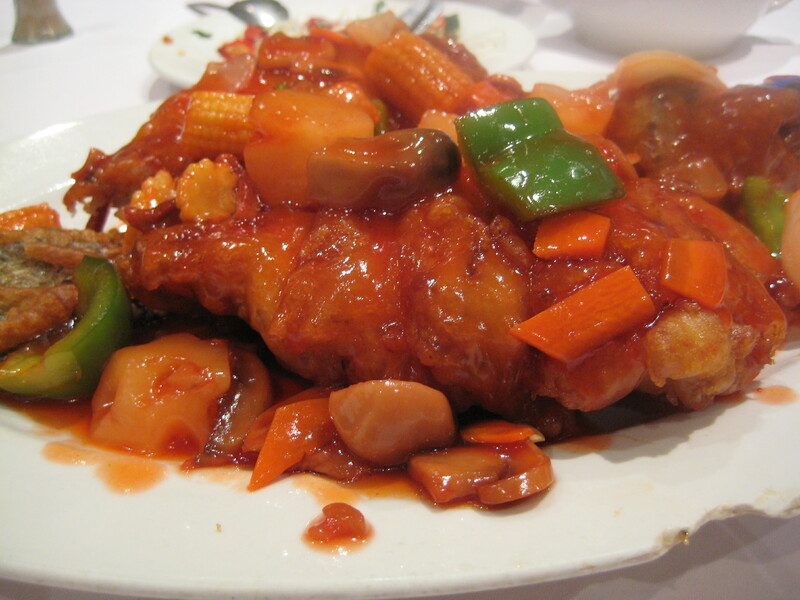 My last meal in Sydney was at Garden Peking Restaurant (read last review here). This is one of our favourite Chinese restaurants in Eastwood. Food is always good, and its quite reasonable! Can you believe we pretty much ordered the same thing as last time, except for this dish – it was deep fried whole fish with sweet and sour sauce and it was fantastic! The fish was fresh, we saw the waiter take it out of the tank. The fish was crispy, but yet tender and moist on the inside, and the sweet and sour sauce, incredible! I love sweet and sour sauce.. especially sweet and sour pork. As much as I love spending time with friends and family, I am glad to be back in Hong Kong, however, the weather the past couple of days have been totally and utterly horrible! 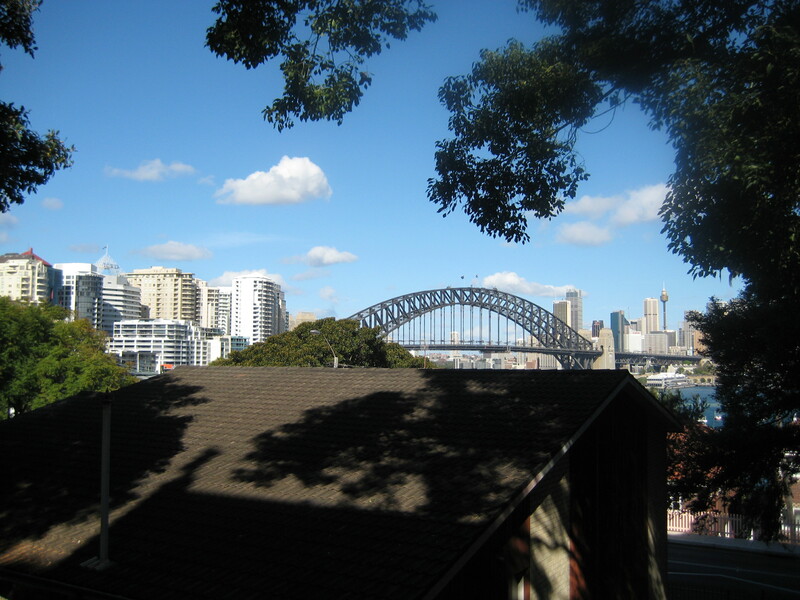 Here’s a view of a glorious, autumn day in Sydney, taken from North Sydney – I do take it for granted! 11/20 not bad not bad!! !